In their live form, Tedeschi Trucks Band's songs are malleable things – often extended to more than double their recorded length, pushed to their breaking points and back with astounding instrumental excursions. 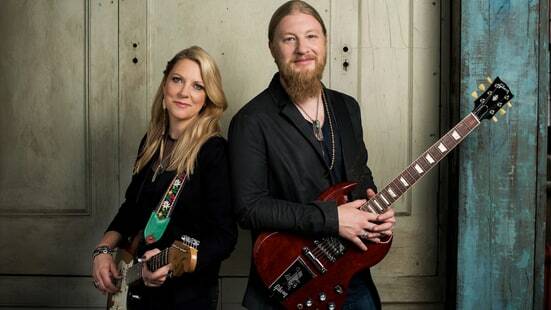 The group, led by husband-and-wife duo Susan Tedeschi and Derek Trucks, show off that exemplary live interplay with a set-closing rendition of "Let Me Get By" from their new live album and first-ever concert film Live from the Fox Oakland, out today. What's remarkable is the fact that, for a song in waltz-time, this 10-minute performance of "Let Me Get By" never drags. Singer-guitarist Tedeschi strums as she evokes Bonnie Raitt's bluesy howl, stepping back to let the band embellish. It's constantly shifting between verses, whether it's jazz-influenced organ detours, splotches of brass, or an explosive slide guitar solo from Trucks that takes it home. "'Let Me Get By' is something of a mission statement for our band and this version is a special one. We've been playing it live for a year or so now and it always goes to new and interesting places. The Oakland show was an amazing night and the band was firing on all cylinders for the last song of the set." Recorded on September 9th, Live from the Fox Oakland includes 15 songs from Tedeschi Trucks Band's performance at the Oakland Theater. In addition to originals like "Let Me Get By" – the title track from their 2016 album – the group tries out covers of Leonard Cohen's "Bird on the Wire" and Bobby "Blue" Bland's "I Pity the Fool." This weekend, the band begins a run of European dates in Munich, Germany. 1. "Don't Know What It Means"
3. "Bird On the Wire"
4. "Within You, Without You"
7. "These Walls (featuring Alam Khan)"
12. "I Want More (Soul Sacrifice outro)"
13. "I Pity the Fool"
15. "Let Me Get By"